On 1 March 1757 Damiens the regicide was condemned "to make the amende honorable before the main door of the Church of Paris", where he was to be "taken and conveyed in a cart, wearing nothing but a shirt, holding a torch of burning wax weighing two pounds"; then, "in the said cart, to the Place de Grève, where, on a scaffold that will be erected there, the flesh will be torn from his breasts, arms, thighs and claves with red-hot pincers, his right hand, holding the knife with which he committed the said parricide, burnt with sulphur, and, on those places where the flesh will be torn away, poured molten lead, boiling oil, burning resin, wax and sulphur melted together and then his body drawn and quartered by four horses and his limbs and body consumed by fire, reduced to ashes and his ashes thrown to the winds" (Pièces originales..., 372-4). "It is said that, though he was always a great swearer, no blashemy escaped his lips; but the excessive pain made him utter horrible cries, and he often repeated: 'My God, have pity on me! Jesus, help me!' The spectators were all edified by the solicitude of the parish priest of St Paul's who despite his great age did not spare himself in offering consolation to the patient." "There were those who made something of the fact that a dog had lain the day before on the grass where the fire had been, had been chased away several times, and had always returned. But it is not difficult to understand that an animal found this place warmer than elsewhere" (quoted in Zevaes, 201-14). "Art. 17. The prisoners' day will begin at six in the morning in winter and at five in summer. They will work for nine hours a day throughout the year. Two hours a day will be devoted to instruction. Work and the day will end at nine o'clock in winter and at eight in summer. Art. 18. Rising. At the first drum-roll, the prisoners must rise and dress in silence, as the supervisor opens the cell doors. At the second drum-roll, they must be dressed and make their beds. At the third, they must line up and proceed to the chapel for morning prayer. There is a five-minute interval between each drum-roll. Art. 19. The prayers are conducted by the chaplain and followed by a moral or religious reading. This exercise must not last more than half an hour. Art. 20. Work. At a quarter to six in the summer, a quarter to seven in winter, the prisoners go down into the courtyard where they must wash their hands and faces, and receive their first ration of bread. Immediately afterwards, they form into work-teams and go off to work, which must begin at six in summer and seven in winter. Art. 21. Meal. At ten o'clock the prisoners leave their work and go to the refectory; they wash their hands in their courtyards and assemble in divisions. After the dinner, there is recreation until twenty minutes to eleven. Art. 22. School. At twenty minutes to eleven, at the drum-roll, the prisoners form into ranks, and proceed in divisions to the school. The class lasts two hours and consists alternately of reading, writing, drawing and arithmetic. Art. 23. At twenty minutes to one, the prisoners leave the school, in divisions, and return to their courtyards for recreation. At five minutes to one, at the drum-roll, they form into workteams. Art. 24. At one o'clock they must be back in the workshops: they work until four o'clock. Art. 25. At four o'clock the prisoners leave their workshops and go into the courtyards where they wash their hands and form into divisions for the refectory. Art. 26. Supper and the recreation that follows it last until five o'clock: the prisoners then return to the workshops. Art. 27. At seven o'clock in the summer, at eight in winter, work stops; bread is distributed for the last time in the workshops. For a quarter of an hour one of the prisoners or supervisors reads a passage from some instructive or uplifting work. This is followed by evening prayer. Art. 28. At half-past seven in summer, half-past eight in winter, the prisoners must be back in their cells after the washing of hands and the inspection of clothes in the courtyard; at the first drum-roll, they must undress, and at the second get into bed. The cell doors are closed and the supervisors go the rounds in the corridors, to ensure order and silence" (Faucher, 274, 82). We have, then, a public execution and a time-table. They do not punish the same crimes or the same type of delinquent. But they each define a certain penal style. Less than a century separates them. It was a time when, in Europe and in the United States, the entire economy of punishment was redistributed. It was a time of great "scandals" for traditional justice, a time of innumerable projects for reform. It saw a new theory of law and crime, a new moral or political justification of the right to punish; old laws were abolished, old customs died out. "Modern" codes were planned or drawn up: Russia, 1769; Prussia, 1780; Pennsylvania and Tuscany, 1786; Austria, 1788; France, 1791, Year IV, 1808 and 1810. It was a new age for penal justice. Among so many changes, I shall consider one: the disappearance of torture as a public spectacle. Today we are rather inclined to ignore it; perhaps, in its time, it gave rise to too much inflated rhetoric; perhaps it has been attributed too readily and too emphatically to a process of "humanization", thus dispensing with the need for further analysis. 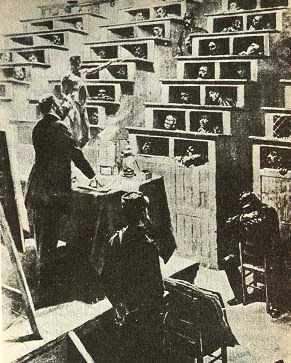 And, in any case, how important is such a change, when compared with the great institutional transformations, the formulation of explicit, general codes and unified rules of procedure; with the almost universal adoption of the jury system, the definition of the essentially corrective character of the penalty and the tendency, which has become increasingly marked since the nineteenth century, to adapt punishment to the individual offender? Punishment of a less immediately physical kind, a certain discretion in the art of inflicting pain, a combination of more subtle, more subdued sufferings, deprived of their visible display, should not all this be treated as a special case, an incidental effect of deeper changes? And yet the fact remains that a few decades saw the disappearance of the tortured, dismembered, amputated body, symbolically branded on face or shoulder, exposed alive or dead to public view. The body as the major target of penal repression disappeared.